Over the years, Palestinian Media Watch (PMW) has documented numerous expressions of Nazi sympathies by PA and Fatah leaders. 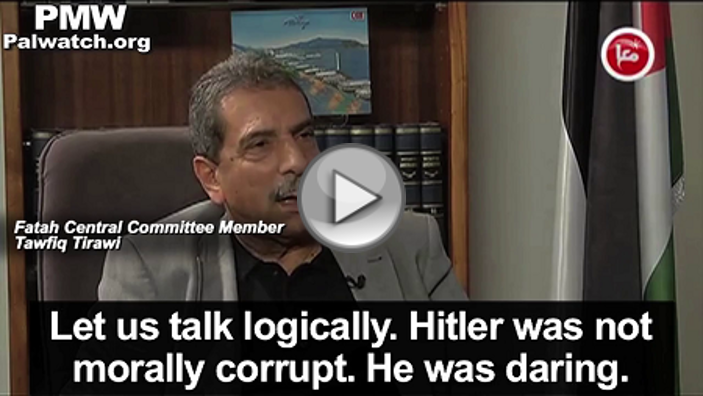 Admiration of Hitler is one part of the Palestinian Holocaust denial and distortion. Alongside the 31 PA schools PMW has documented that are named after terrorists including murderers such as Dalal Mughrabi, the PA also named three schools after Nazi collaborators. One school was a result named after Nazi collaborator and war criminal Amin Al-Husseini and two others named after Nazi collaborator Hassan Salameh. Obviously, schools are named after people who the PA Ministry of Education sees as role models and aspires for the students to emulate. Amin Al-Husseini was the Grand Mufti of Jerusalem at the time of the British Mandate. During World War II he moved to Berlin, where he collaborated with the Nazis and was an associate of Hitler. Al-Husseini was responsible for a Muslim SS division that murdered thousands of Serbs and Croats and was on Yugoslavia’s list of wanted Nazi war criminals. When the Nazis offered to free 5,000 Jewish children, Al-Husseini fought against their release which caused 5,000 children to be sent to the gas chambers. Hassan Salameh was a leader of Arab gangs in the Lod and Jaffa region in the 1930s and 1940s. He was a loyal follower of Amin Al-Husseini. In 1941, Salameh was recruited to be a Nazi agent, and in 1944, he was sent on a mission by the Nazis in the British Mandate Palestine, with the goal of starting an Arab revolt against the British and poisoning Tel Aviv's water sources. The plot was discovered and thwarted by the British. 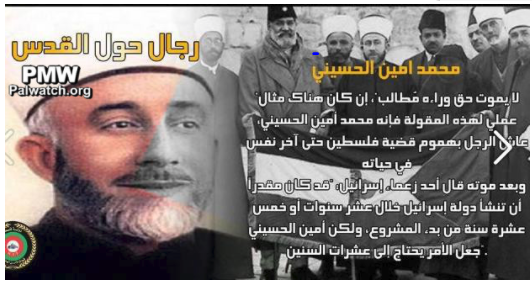 In 1947, Salameh was appointed by Al-Husseini as Deputy Commander of the "Holy Jihad" Army that fought Israel in the 1948 War of Independence. The PA sympathy with Amin Al-Husseini is not limited to the PA Ministry of Education. A post on the Facebook page of the PA National Security Forces, similarly glorified him. The picture shows Mufti Amin Al-Husseini. 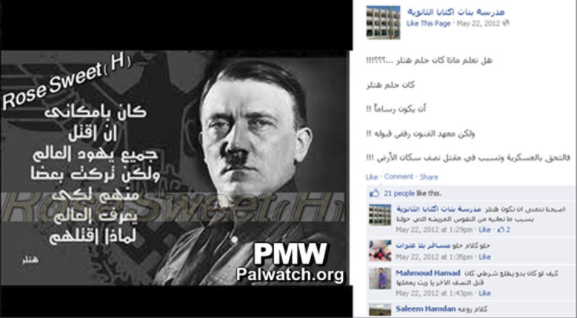 Finally, seeing Hitler as a positive figure is being passed on to Palestinian youth. Zayzafuna, a Palestinian children’s magazine funded by the PA, accepted for publication a submission by a 10th grade Palestinian girl which presented Hitler, not only as a positive figure, but one to be admired because he killed Jews in order to benefit all humanity. The girl’s submission describes her dream in which she met four heroic historical figures and has a conversation each of them. Three of them were renowned Muslims, including a Nobel Prize recipient and a math scholar, and the fourth was Hitler: "You're the one who killed the Jews?" she said to Hitler. Hitler responded: "Yes. I killed them so you would all know that they are a nation which spreads destruction all over the world." The following is from the essay in Zayzafuna presenting Hitler with other positive role models. I said [to Hitler]: 'Thanks for the advice.'" 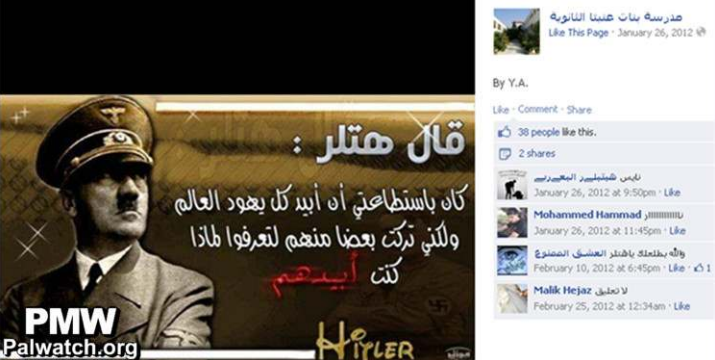 Although repugnant, a Palestinian teenager's admiration for Hitler because he killed Jews, alongside other Muslim role models, is not unexpected. As PMW documents, Palestinian children are brought up with the teaching that killing Israelis and Jews is heroic. The PA has named streets, schools, sporting events and more after Palestinian terrorists who have killed hundreds of Israeli civilians. In Palestinian cultural, educational and social events, every Palestinian child is exposed to repeated glorification of terrorists who have killed Jews. It is not surprising that a Palestinian child who has been educated to see those who have murdered Jews as heroes and role models will conclude that Hitler, the one who murdered the most Jews in history, is likewise worthy of admiration.